Many congratulations to our Provincial Grand Chaplain Godfrey Hirst who has been honoured with the very high grand rank of Past Assistant Grand Chaplain. Initiated into Semper Fidelis Lodge No 4428 in 2004, Godfrey was passed to the second degree and raised to the third degree in 2005. 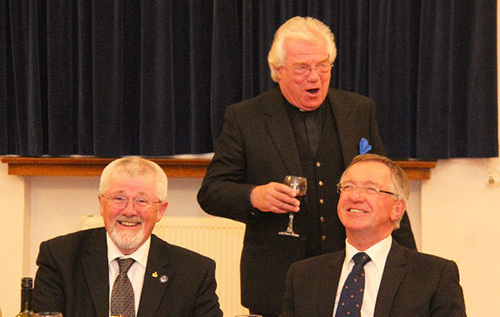 Godfrey was installed into the master’s chair in Semper Fidelis Lodge in February 2011. In 2012 he was appointed Provincial Deputy Grand Chaplain and in 2015 Provincial Grand Chaplain. Godfrey was also installed as first principal of Semper Fidelis Chapter No 4428 in February 2014. Godfrey’s full title is the Reverend Canon Godfrey Hirst. He was on the Blackburn Cathedral staff before his move to Lytham. His first event as Provincial Deputy Grand Chaplain was at the centenary meeting of Ansdell Lodge No 3607 in June 2012 at the Palace, Lytham St Annes. 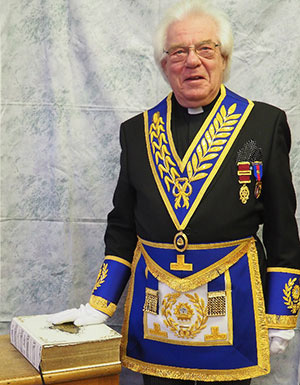 He went on to officiate at many other events until his appointment to Provincial Grand Chaplain in 2015. More memorable responsibilities of Godfrey’s during the current Masonic year have been to deliver moving orations at the various tercentenary celebration services at several West Lancashire churches including Lancaster Priory and St Elphin’s Church, Warrington. Godfrey was also in fine form at the Blackpool Tower Ballroom for the consecration of Pro Patria Lodge No 9952, where he delivered yet another oration in his own inimitable style. 2018 finds Godfrey appointed and invested as Past Assistant Grand Chaplain. In the grand scheme of things, this is rank number 63 in Rule 5 of the Book of Constitutions. In general terms it fits between Past Junior Grand Deacon and Past Assistant Grand Director of Ceremonies. Not that this worries him unduly, he was visiting Tithebarn Lodge No 8446 on his first meeting out as a grand officer and proved to be the warm and very approachable brother known to all who meet him. Godfrey (standing) brings smiles from Dave Barr (left) and John-Robbie Porter. Many brethren will have their own memories of Godfrey Hirst. Without doubt his ebullient renditions of the master’s song at installation festive boards will spring readily to mind; not to mention his unique style of prayers before and after meals. Most of all, however, is that approachability that comes so naturally to him. We all hope to enjoy meeting Godfrey for many years to come.